Prior to the First World. War in Ljubljana acted pupil Hermes Club (founded in 1910), Illyria (1911) and Slovan (1913). Illyria and Slovan renewed in 1919., And the 1920th Slovene. refugees from that part of the country was annexed to Italy formed the Coast. Main competitors in this period were Illyria and Coast. Because of financial. difficulties 1935th Slovan and Illyria merged into SK Ljubljana, which is the best Slovene. Club competed in the first division. After II. WWII. War Ljubljana remaining players are teaming up with clubs and Udarnik Tabor and the late 1945th Enotnost established, the forerunner of Olympia. God. 1948th Club takes the name Squadron, 1953. becomes the first league club, but is unable to sustain, 1961. takes a short name Triglav and ga after half a season changing in Olympia. Since 1965. to 1984. O. is 19 consecutive seasons competed in the first jugosl. League. 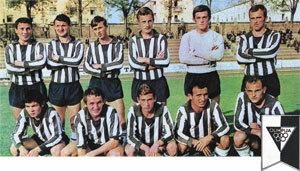 Best ranking was seventh place 1971st and 1983. and performance in the cup final 1970th For Olympia, which at that time played the best Slovene. Players: D. Popivoda, B. Oblak, V. Ameršek, M. Elsner and S. Katanec, and the players who stepped Olympia greatest impression left R. Bečejac. Back in the first jugosl. 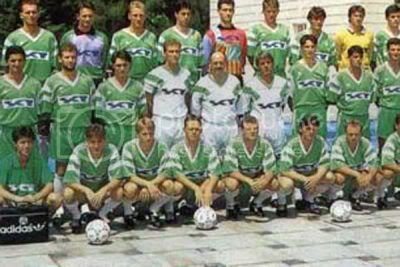 the league has made in 1990., and in summer 1991. left the competition in jugosl. League and joined the competition in the new Slovene. League. In the first half. 1990-O it was the most successful Slovene. club, consecutive champion 1992-95., but after that show poor performance in the championship. Winner of Slovenia. Cup was in 1993., 1996., 2000. and 2003. Olympia appearances at the Central Stadium (Stadium Bežigrad) which is 1923-26. built and 1938. renovated by architect J. Plečnik. Lighting has introduced the 1978th​​, and after the last Planning 1996th auditorium has a capacity of 8259 seats. Recognizable part of the stadium bleachers at the southern honor. page. Club colors green, resp. green-and-white. To 1970. O. has played in black and white jersey. 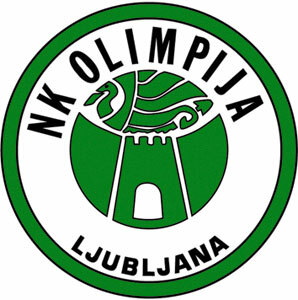 Throughout its history Olimpija was regarded as one of the most successful clubs in Slovenian football until its dissolution in 2004, when the club, with a debt consisting of over 700 million Slovenian tolars (around three million euros in 2004 exchange rate), filed for bankruptcy and was dissolved by the end of year. However, the Football Association of Slovenia had exceptionally allowed the club to finish the 2004–05 season and, after finishing sixth in the national championship, Olimpija effectively ceased all operations.